One of the newest galleries along the Wasatch Front has a decidedly northern flair—northern Utah, that is. 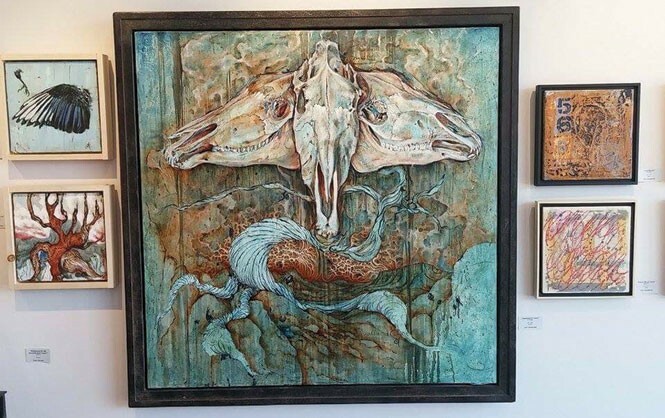 Thomas Howa opened Howa Gallery in Bountiful on May 9 and the 30 artists in the debut show—representing just about every imaginable artistic genre and style in the area—offer a remarkable cross-section of current local artists. Their works range from challenging, abstract paintings and sculptures to more readily accessible representational paintings featuring Western motifs and landscape; glass art, pottery, jewelry and even clothing are also featured. It was one of the most exciting and well-attended art openings of the spring season. As a successful businessman and an artist in his own right, Howa has a unique perspective on the local arts scene and on operating a gallery—and that perspective shows in his selection of artists and design of the space. "[Since I'm] familiar with the art community in the state, as well as some out-of-towners, the show was invitational at first," Howa says. "But then, as news traveled, artists contacted me." The Salt Lake City resident has had an art studio in Bountiful for three years, and when a space became available next door to that studio, he jumped at the chance. "I always wanted to be in the art-gallery business, and the space is ideal," he says. In addition to the 30 "house" artists at the opening, he plans in the coming months to mount shows featuring solo artists. Frank McEntire, who has several sculptural pieces in the show, says, "Thomas Howa's gregarious personality and desire to be an influence in Utah's art scene are but two reasons he had no refusals by artists to his invitation to show their work in his new Bountiful gallery, myself included. His inaugural exhibition showcased an eclectic mix of work by a diverse group of artists, some [who have been] friends for many years and others I'm just getting to know—a third reason for me to have consented to his invitation. Besides, not many people venture to my studio way out west in Kearns. And for Tom to do so showed me how serious he was about me and my work." Abstract painter Layne Meacham, also featured at Howa, applauds the gallery's diversity and approach: "It's high time that a third contender entered the ring, giving A Gallery and Phillips a run for their money. Howa is a businessman, not an arty social butterfly. He stacks 'em deep, and when he sells a piece, there is no red-dot baloney; he puts up more stock, and the buyer hauls out their artwork. I watched this, personally, a number of times. He also has a sense of humor and likes to have a lot of fun. I can let myself be 12 years old around him." Prior to becoming a full-time artist in 1998, Howa was vice-president of Howa Construction for 24 years. "This business gave me the experience that is required to operate a profitable, sustainable business," he says. "I carried this philosophy not only as artist, but in incorporating basic business models. "The community north of Salt Lake is flourishing—the whole bench, from Farmington to Ogden," Howa says. "With more homes being built in the area, and more affluent residents, it's becoming a real art community. Davis County is the fastest-growing county in the state, with the highest median income. From there to Ogden, art options have been limited." Along with the recent remodeling of the Bountiful-Davis Art Center, he hopes Howa Gallery will help attract Salt Lakers, as well as those farther north who are eager to view a wide variety of local artists on display. It's uncertain what underlying scheme informs how the artworks on the wall are organized, unless it's sheer eclecticism—and that is a strength. The overall quality of the work suggests a democracy of styles, in which everything should be considered equally. Viewers can proceed from John Collins' oil "Wasatch Fall Aspens" directly to a Bill Lee abstract painting like "DKY831" with all its frenetic energy, or from the intricate detail of Alexander Hraefn Morris "City to Sea 0720" to a David Maestas with its violent brushstrokes. The playfulness of Susan Kirby's oil "Cat on Oriental" or Traci O'Very Covey's gouache "Two Birds With Flora," influenced by fabric art, meld in the mind with the sociopolitical impact of a work like Lenka Konopasek's oil "Flooded Landscape New Orleans"—and the effect is quite breathtaking, if not downright mind-blowing. Like any innovative gallery space, Howa's has the effect of being pleasantly educational, coaxing you to look at the world anew. "Diversity was the main objective," he admits. "Realism, abstraction, sculpture, jewelry—I wanted to include a lot of different things here."